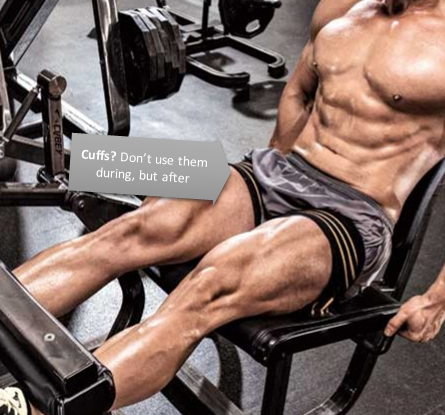 Single-legged leg presses that make both legs stronger are only one of many topics, today. Time for an update on the latest resistance training research - just the interesting stuff, obviously ;-) What exactly? Well, let's see: We'll take a look at how long rest periods sustain the exercise induced. Then, we'll dive right into a placebo-controlled study on blood flow restriction as a means of preconditioning before resistance training, only to top things off with a study that found that training your dominant leg will also increase the leg press strength of the untrained, non-dominant limb. Ah, and since there was some space left in the bottom line, we will acknowledge that AM vs. PM training have identical effects on power, force and hormonal response in young men and pretend to be surprised that a three-set upper-body workout is much more energetically demanding than its one-set analog. All in all, a very balanced update on the latest resistance training research, I'd say. Long rest periods prolong testosterone response to bench press exercise -- From various previous SuppVersity articles you know that resistance training triggers an acute increase in testosterone. That this increase may depend on the rest between sets, though, is news. News from a recent article in the Journal of Strength and Conditioning Research. The purpose of the study was to examine the influence of rest period duration (1 vs. 3-minute between sets) on acute hormone responses to a high intensity and equal volume bench press workout (5x3 sets at 85% of the 1RM, to be specific). Figure 1: Mean (left) and individual (right) free testosterone levels before and after performing bench presses with 1 min or 3 min rest (Scudese. 2015). For total testosterone, both rest lengths enhanced all post-exercise verifications (T0, T15 and T30) compared to PRE, with 1-minute showing decreases on T15 and T30 compared to T0. For free testosterone, both 1 and 3-minute rest protocols triggered augmentations on distinct post-exercise moments (T0 and T15 for 1-minute; T15 and T30 for 3-minute) compared to PRE. Since the the cortisol values did not change throughout any post-exercise verification for either rests, the total testosterone/cortisol ratio was significantly elevated for both rests in all post-exercise moments compared to PRE. The growth hormone values did not change for both rest lengths. Now, that's exciting, right? The free testosterone levels kept increasing... well, not exactly. If you look at the data in Figure 1 right, you will notice interpersonal differences that suggest that the elevation would not have lasted for much more than those 15 extra-minutes . What's of significantly greater importance for the interpretation of the study results is yet a study by West et al. (2012) who observed that the testosterone response (both free and total) to resistance training is not associated with either strength or size gains. So what? It is very likely that the results of the study at hand are of zero practical relevance for your gains (strength- and sizewise, as West's study indicates). Blood flow restriction before strength training? It works - just as well as placebo! -- You will probably remember my recent article about the benefits of using blood flow restricting cuffs before a sprint workout, right (click here if not)? With the publication of the results of Moacir et al. 's (2015) latest study, we do now know that similar benefits will be seen with subsequent resistance training, too. "Thirteen men participated in a randomized crossover design that involved 3 separate sessions (ischemic preconditioning, placebo and control). A 12-RM load for the leg extension exercise was assessed through test and retest sessions prior to the first experimental session. The IPC session consisted of 4 cycles of 5 minutes occlusion at 220 mmHg of pressure alternated with 5 minutes of reperfusion at 0 mmHg for a total of 40 minutes. The PLACEBO session consisted of 4 cycles of 5 minutes of cuff administration at 20 mmHg of pressure alternated with 5 minutes of pseudo-reperfusion at 0 mmHg for a total of 40 minutes. When the researchers analyzed the results, they found that for the first set, the number of repetitions significantly increased for both the IPC (13.08 +/- 2.11; p = 0.0036) and PLACEBO (13.15 +/- 0.88; p = 0.0016) conditions, but not the CON (11.88 +/- 1.07; p > 0.99) condition. 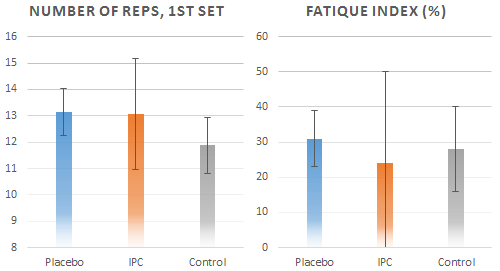 Figure 2: Significant increases in the number of reps (left) were observed for both the placebo and IPC group. The fatique index (right) did not differ between treatments, but the large inter-individual variety in the IPC group clearly suggests that BFR as a means of preconditioning ain't for everyone (Moacir. 2015). Similarly, the IPC and PLACEBO conditions resulted in significantly greater repetitions versus the CON condition on the 1st set (p=0.015; p=0.007) and 2nd set (p=0.011; p=0.019), but not the 3rd set (p=0.68; p>0.99). No significant difference (p=0.465) was found in the fatigue index and lactate concentration between conditions. As the researchers point out, their results "indicate that IPC and PLACEBO ischemic preconditioning may have small beneficial effects on repetition performance over a CON condition" (Moacir. 2015). It is thus not completely logical that they suggest "that ischemic pre-conditioning might be practiced gradually to assess tolerance and potential enhancements to exercise performance" (ibid.). What? Oh, you think your clients would notice that their blood flow is not actually impaired and the placebo effect would be lost? Right, now I understand why you should keep using it. Unfortunately that does not exclude that it is still a placebo effect which seems not unlikely in view of the larg(er) inter-individual differences in the IPC vs. any other group. Further studies are necessary... obviously! Train your right leg, and your left leg will become stronger, too - on leg presses, at least -- What sounds like a joke (or magic) is actually science. Science that is going to be presented in an article in a future edition of the Journal of Strength and Conditioning Research; and more precisely from a study that assessed the cross education of strength and changes in the underlying mechanisms (muscle size, activation, and hormonal response) following a 4-week unilateral resistance training (URT) program. In said study by Beyer et al. (2015), a group of nine untrained men completed a 4-week URT program on the dominant leg (DOM), while cross education was measured in the non-dominant leg (NON); and were compared to a control group (n=8, CON). "Unilateral isometric force (PKF), leg press (LP) and leg extension (LE) strength, muscle size (via ultrasonography) and activation (via electromyography) of the rectus femoris and vastus lateralis, and the hormonal response (testosterone, growth hormone, insulin, and insulin-like growth factor-1) were tested pre- and post-training" (Beyer. 2015). In all strength and size related measures, the trained group improved significantly better than CON. Significant group x time effects for PKF, LP, LE, and muscle size were observed only in the dominant leg (DOM), the non-dominant (NON = untrained leg), on the other hand, the scientist observed not just a trend, but rather an actual and statistically significant increase in leg press strength. 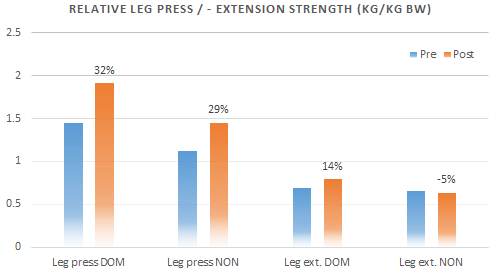 Figure 3: Relative leg press and leg extension strength relative to body weight; the values above the post-bars indicate the relative difference between post and pre-test (2015). Whether that's related to the acute hormonal response to URT, the scientists observed, is more than questionable, after all the strength increase in the non-dominant leg didn't just occur in the absence of "detectable changes in muscle size, activation (EMG), or the acute hormonal response" it did also occur only during leg presses - if it was the result of any of the aforementioned factors one would expect to see at least something like a trend for leg extensions, as well. Against that background it should also be clear that you must not neglect one leg or arm when you train in the definitely false hope it would grow and the almost certainly false hope it would get stronger as you train your "favorite" limb. There's more: In view of the fact that the bottom lines to the individuals studies discussed in SuppVersity Research Overviews are always provided at the end of the respective item, I have room for mentioning two other interesting results at least briefly. Figure 4: Energetic demands of 5x3 vs. 5x1 set upper body workout in men and women. Needless to say that the inter-group difference between 3 vs. 1 sets and the inter-group difference between men and women (not shown) were significant (Mookerjay. 2015). Firstly, Hatfield et al. 's study of the "Effects of circadian rhythm on power, force, and hormonal response in young men" that indicates that "high force and power exercises utilizing bench press-throws or jump squats may be performed any time of day without detrimental decreases in acute performance" (Hatfield. 2015). And secondly, Mookerjay et al. 's "[c]omparison of energy expenditure during single vs. multiple-set resistance exercise" (Mookerjay. 2015) that yielded a very obvious result which was that the multi-set protocols yield greater metabolic and cardiovascular demands than single set protocols when the number of exercises performed are the same (see Figure 4). 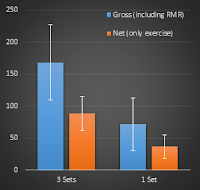 In the study 5 upper-body exercises of either 1 or 3 sets per exercise performed in random order the gross and net energy expenditure was determined for the workout + 5 minutes of recovery. You can see the exact data in Figure 4, in case you're interested | Comment on Facebook! Beyer, et al. "Short-Term Unilateral Resistance Training Results in Cross Education of Strength without Changes in Muscle Size, Activation, or Endocrine Response." Journal of Strength and Conditioning Research (2015): Ahead of print. Hatfield, et al. "Effects of circadian rhythm on power, force, and hormonal response in young men." Journal of Strength and Conditioning Research (2015): Ahead of print. Moacir, et al. "Ischemic preconditioning and placebo intervention improves resistance exercise performance." Journal of Strength and Conditioning Research (2015): Ahead of print. Scudese et al. "Long rest interval promotes durable testosterone responses in high intensity bench press." Journal of Strength and Conditioning Research (2015): Ahead of print.